Kartikeya and Payal Rajput's RX 100 full Telugu movie was leaked on torrent sites and its free download to affect its collection at box office. Telugu movie RX 100 starring Kartikeya and Payal Rajput has been leaked on torrent sites a day after it hit the screens and its free download will affect its collection at the box office in the coming days. Some miscreants allegedly recorded the full movie of RX 100 during its screening in a cinema hall on the first day of its release. Later, they released the complete film on their torrent sites for free download. This pirated copy made its way to other websites within hours after. The people, who watched this copy, say that it has poor audio and video quality and it will disappoint the viewers. RX 100 is a small budget movie produced by Ashok Reddy Gummakonda. Its theatrical rights were sold for Rs 2.70 crore and the movie has recovered 50 percent of the investments, by earning Rs 1.42 crore for its distributors. The film would return the remaining 50 percent of the investments with some profits to its distributors in its opening weekend. It will bring distributors in the safe zone in just three days. RX 100 has been released in a limited number of screens and the strong word of mouth has created a huge demand for the film. Some viewers may opt to download its pirated copy due to its unavailability in their nearby location/city. This is likely to eat away the profit shares of its distributors. 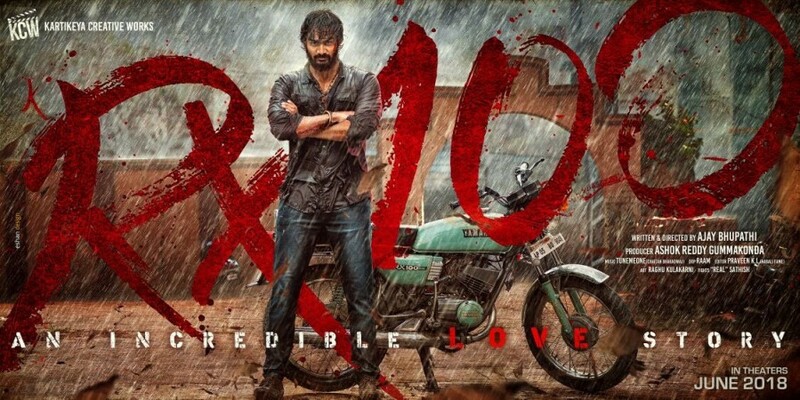 Written and directed by Ajay Bhupathi, RX 100 is a raw and real love story set in a village in Godavari district. Shiva is a guy from a middle-class family and he falls in love with rich girl Indhu and the love blossoms between the couple. But they are separated when they are about to disclose the affair to their elders. How they reunite forms the rest of the story. Karthikeya and Payal Rajput have played Shiva and Indhu and their performance and chemistry are the highlights of RX 100. Rao Ramesh and Ramki's acting, background score, picturisation and engrossing screenplay are other attractions of the film, which has been successful in striking a chord with everyone.